I mentioned in my previous post that our hotel on Ishigaki Island in the far south of Japan had only “okay” food. However, their food sometimes offered me, as an English speaker, a bit of extra entertainment. The label above was on one of the items in the breakfast buffet. I redacted out the name of the dish in Japanese. Can you guess what the original Japanese was? It was clear from my overall experience at the hotel that they used machine translation (that is, computer non-human translation) for their menus. One menu had “Popsicle” as the translation for what should have been “Pepsi-Cola”. I understood the Japanese just as little as the English. LOL. My guess is that green tea was translated to unpolished tea with further degradation to rough tea. Wow, even reading the katakana I can’t figure out what this is supposed to say. I see the word for restaurant in there and that’s about it. I’ll give a little hint: it’s a food dish, one I would normally associate with dinner, but in any case, it has nothing to do with tea or any other beverage. 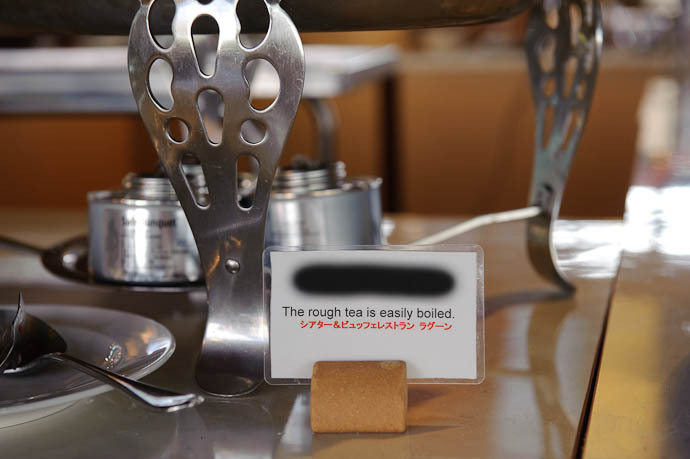 I’m guessing “rough tea” is actually a food dish ending with “-ty” or “-ti” — maybe a pasta of some kind would also explain the “easily boiled”? Is there a ruffiti pasta? Mm mm, gimme some o’ dat bacon!